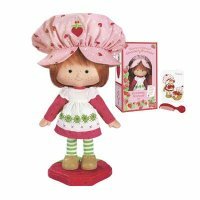 I certainly remember my sister owning a Strawberry Shortcake doll, but I didn’t realise that, like the Care Bears, Strawberry Shortcake started off as a range of greetings cards from American Greetings. The characters were introduced as cards in 1977, but it wasn’t until the 1980’s when the toy range really made it’s mark, spawning other merchandise such as comic books, videogames and the inevitable cartoon series. It’s Strawberry Shortcake in her floppy hat. Strawberry Shortcake and Custard the Cat. As already mentioned Ms. Shortcake was joined by friends such as Apple Dumplin’, Raspberry Tart and Lemon Meringue. With names like that most of the toys were female, although there was the odd male character thrown in as well. The advent of the cartoon series meant that Strawberry Shortcake required a nemesis to go up against, which ended up being the tongue twistingly named Peculiar Purple Pieman of Porcupine Peak! He too came with a pet – Captain Cackle the Berry Bird.Whilst researching this post I was surprised to find that not only is Strawberry Shortcake still available, the character has also been through two major design revamps. In 1991 toy manufacturer THQ relaunched a range of six dolls, but these only lasted for a year or so before disappearing from our shops. A more successful makeover occured in 2002 by Bandai which is still available today and has led to further cartoon movies, books, videogames and probably much more. This revamp made the characters look more like normal girls, dressed in jeans and T-shirts rather than frilly dresses and stripy tights, which seems a bit of a shame to me as the dolls have lost most of their distinctive look. Oh well, times change I guess, and it’s obviously worked for the toys to be selling. This entry is filed under Toys - Dolls and Action Figures, TV - Cartoons	and was posted on March 21st, 2008. You can follow any responses to this entry through the RSS 2.0 feed. You can leave a response, or trackback from your own site. (Gosh – we had a lovely Maine Coone cat named Boo which my daughter now owns!) Thank you for writing this background piece on the evolution of Strawberry Shortcake. I wasn’t too aware of the character in the ’80s because I was still single and in my twenties, and was yet to have my own daughters, nieces, daughters’ girlfriends, etc. So I must have missed it! That was too bad but I really like Strawberry and Co. – especially the original designs. 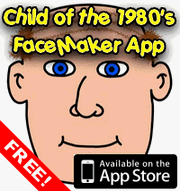 I enjoy the updated ones, too, but I agree with you about losing the distinctive look which I preferred myself. I appreciate this March ’08 review and hope you receive this email! I’ll be sitting down and drawing a similar cartoon-y character in next few days hence my late-night “research” of Strawberrry Shortcake images and info. Question: Do you know where I might purchase the doll in the photo? I like this one the most of ANY that I’ve seen here in internet-land but haven’t seen it on any website, whether Hasbro, Toys R’Us, etc. To me, it’s the classic, iconic Strawberry Shortcake! Thanks again, Boo! Hope you’re doing ok these past few years.